Objective: Identify financial goals and develop budgeting strategies. Write the word “BUDGET” on the board and ask the class to create a web diagram around the word. How many of you know that your parents keep a budget? Explain how they budget. Why is keeping a budget important? The new word that the FDIC education program likes teachers to use is spending plan instead of budget. I like to talk about both and ask the students what the difference is. Start from scratch with the class making a budget. Tape 10 envelopes on the board so you can put money in them. Explain to the class that you’re going to start budgeting based on the $1500 pay check you just got. Take $1500 in play money and decide what envelop categories you should create and how much money you should put in each envelope. Have the class help you. 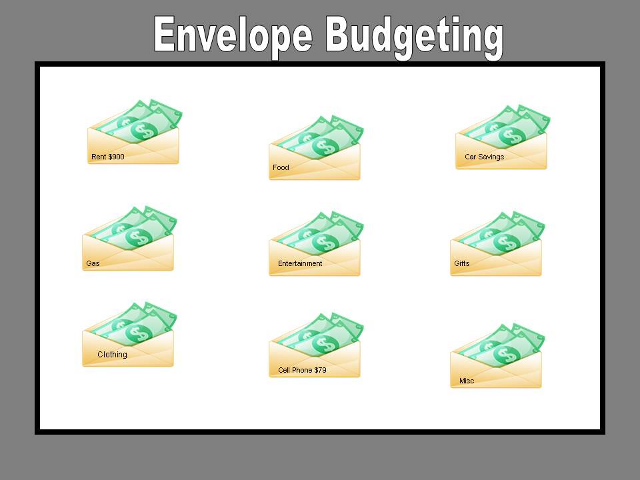 Remember that you need to know your expenses or at least an estimate to know how much money should go in the envelope. Now that you have allocated your paycheck to different envelopes, what happens when you spend more than is in that envelope? You can transfer money between envelopes but you should be careful not to get into debt. What about large purchases? Say you need to buy a new winter jacket in the fall. Start saving for it now by taking the total price/ # of months until you will purchase it = the $ you need to save each month. What happens when you get your phone bill? Take the money out of the envelope and pay the bill. You will re-fund the envelope your next pay check. Discuss how to do this practically using an index card or keeping track in a spread sheet. 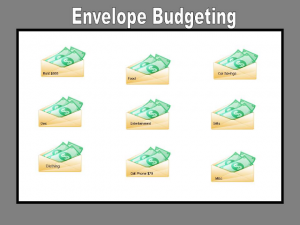 There are also electronic envelope budgets available – see websites below. Have students create their own budget for what they currently make/spend. The “Setting up Budget” worksheet should help them get started. After the students have kept track of their spending, have them write up their own envelope budget. You can give them actual envelopes and have them write the category and amount funded on the outside of the envelope. People often complain about budgeting. What do you think makes it so hard? How do you think you could make budgeting a life style? What are the steps to making a budget?